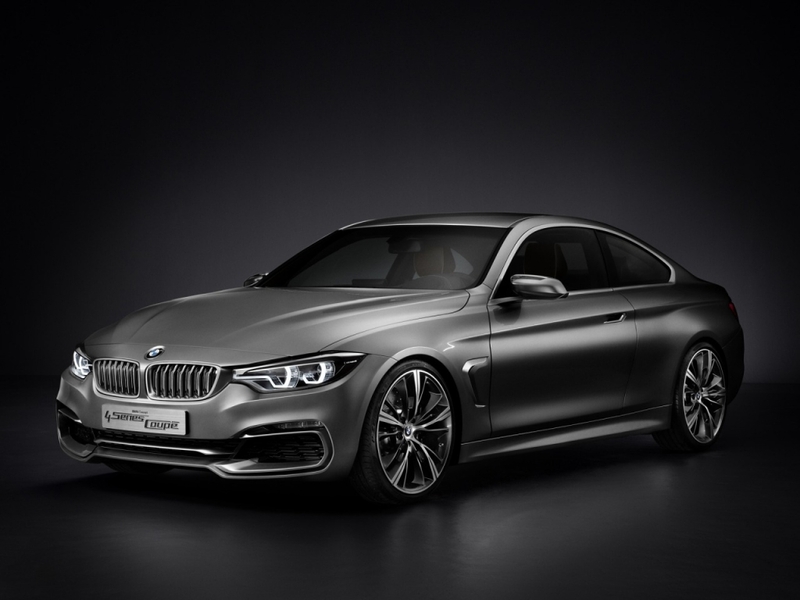 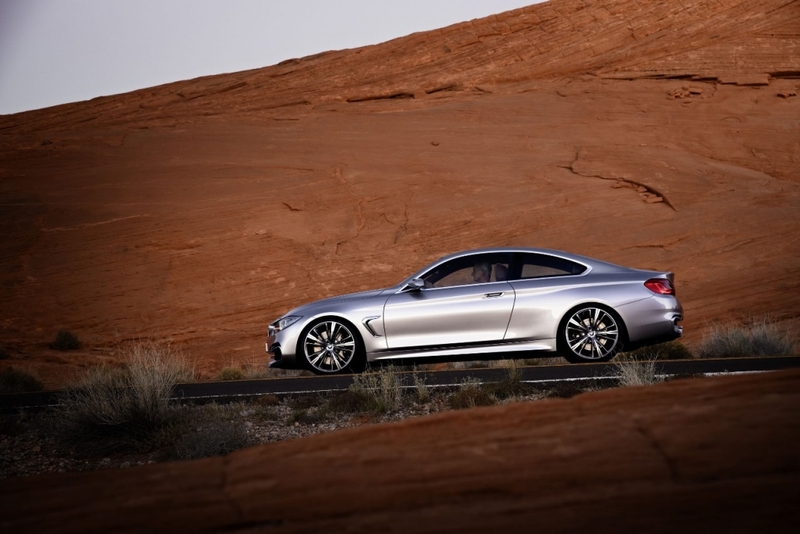 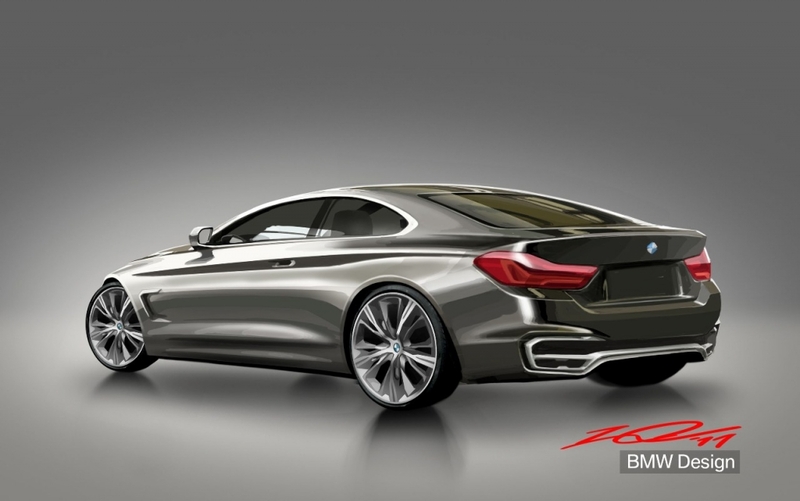 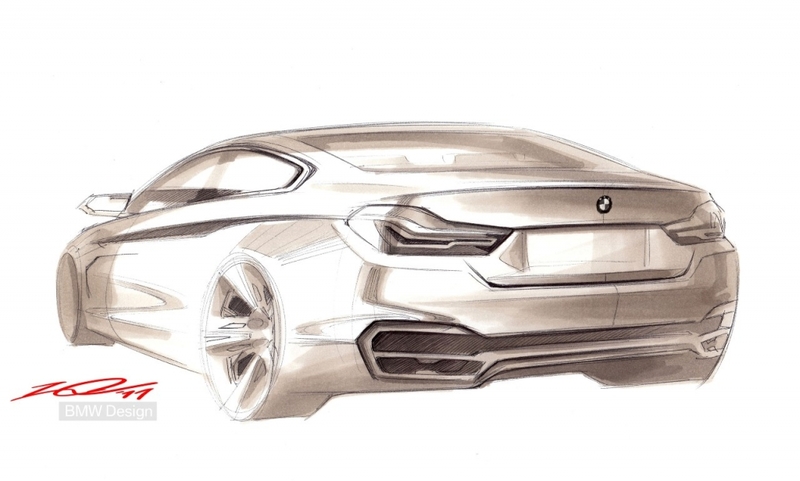 The BMW Concept 4 Series Coupe from the onset is clearly seen to build on the attributes of the BMW 6 Series and BMW 8 Series Coupes. 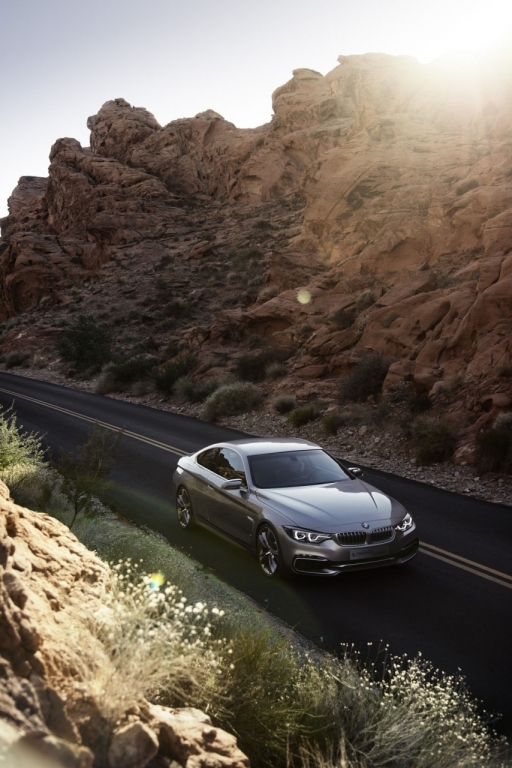 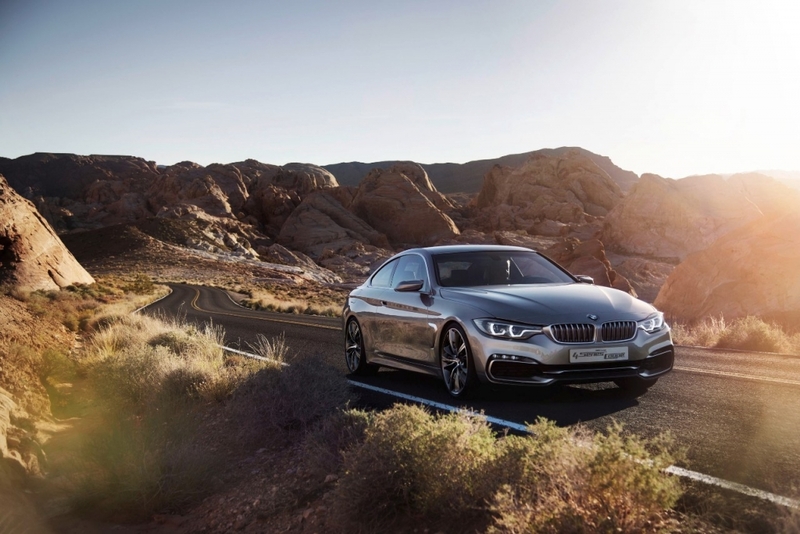 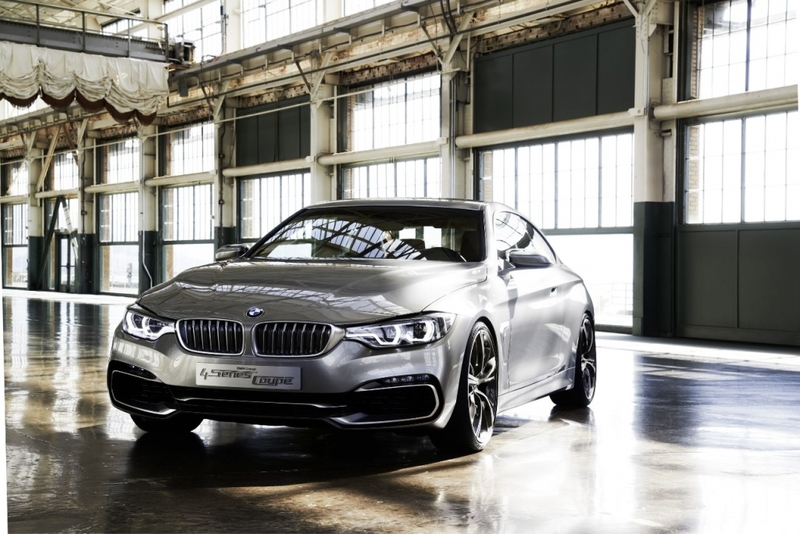 According to BMW the BMW Concept 4 Series Coupe embodies the qualities of sportiness and exclusivity in terms of its aesthetics, dynamics and elegance. 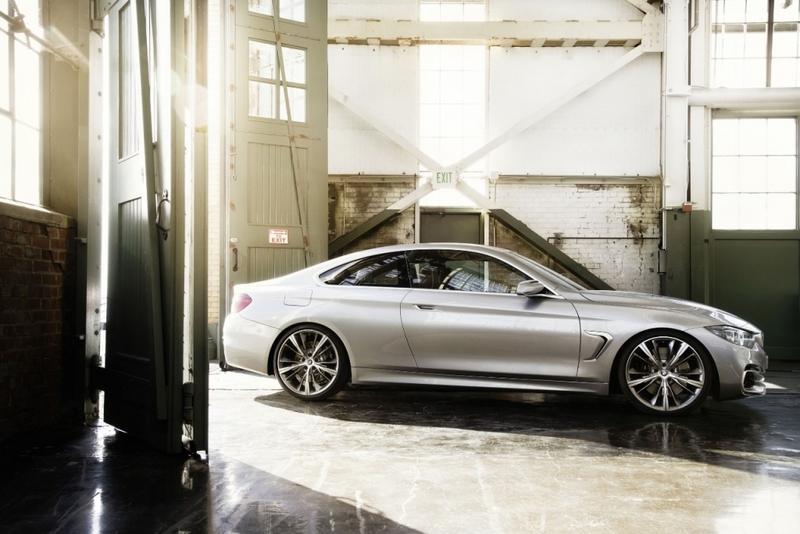 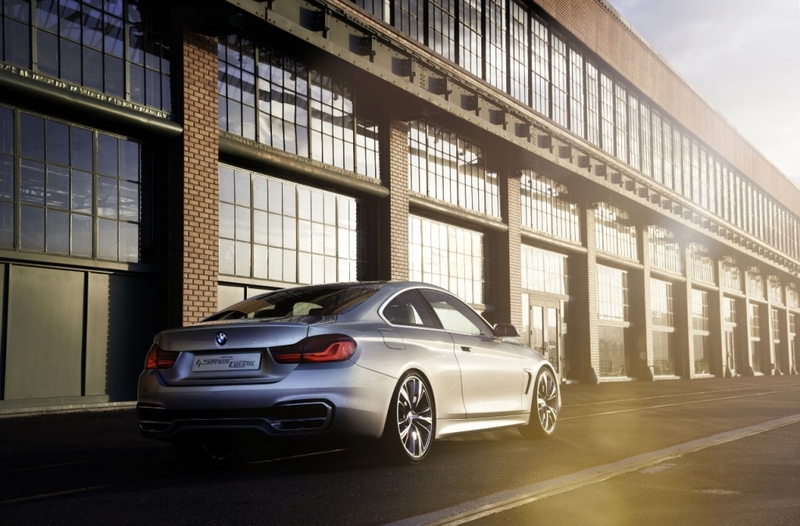 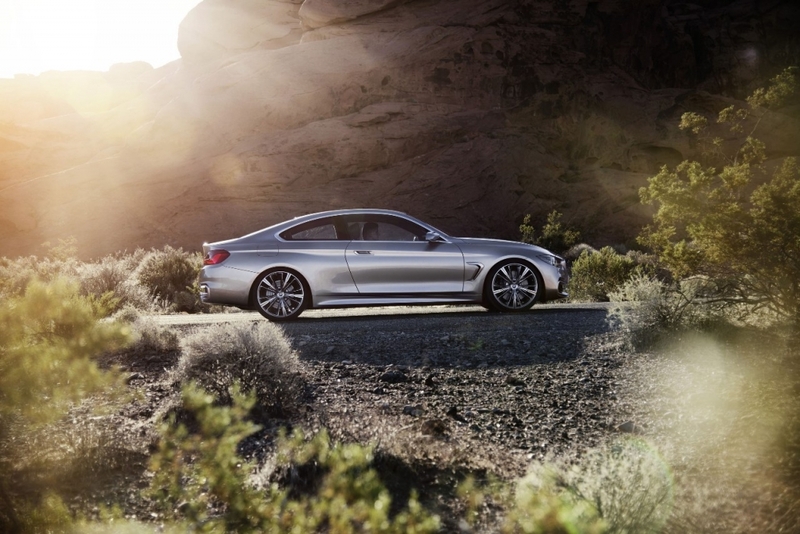 An array of high-quality details provide an exclusive showcase for the car’s perfectly balanced coupe proportions. 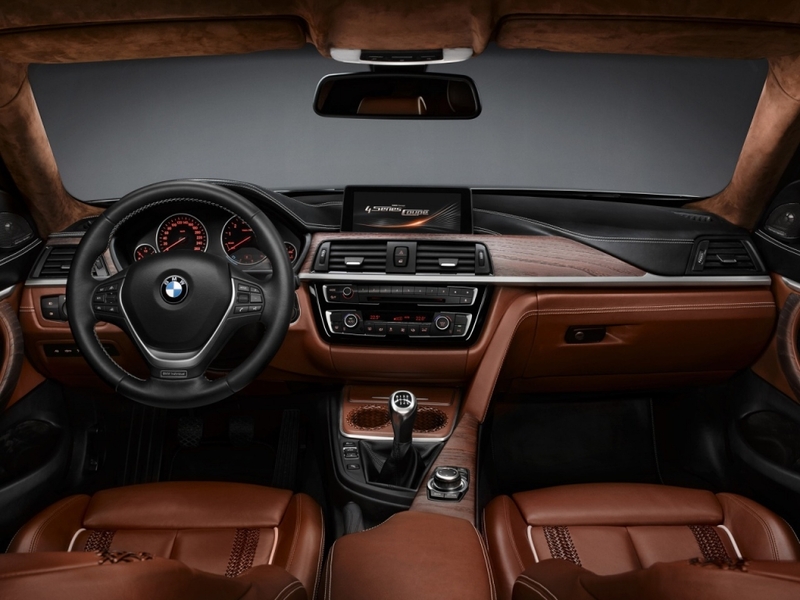 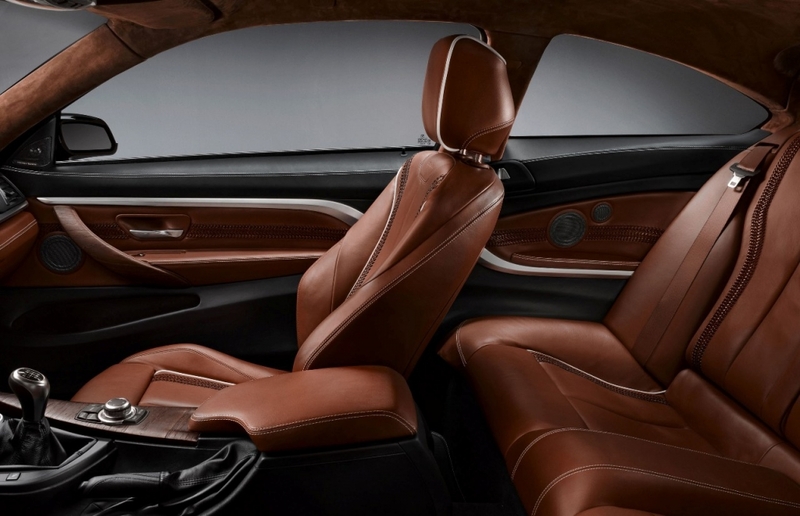 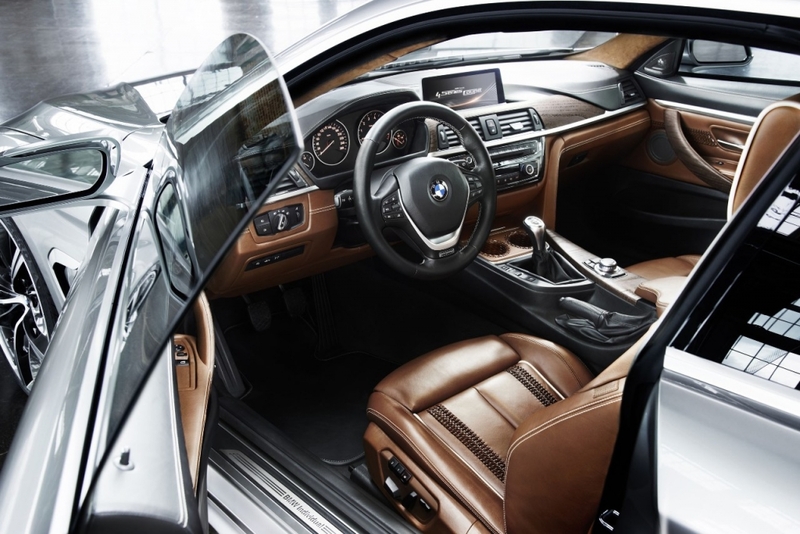 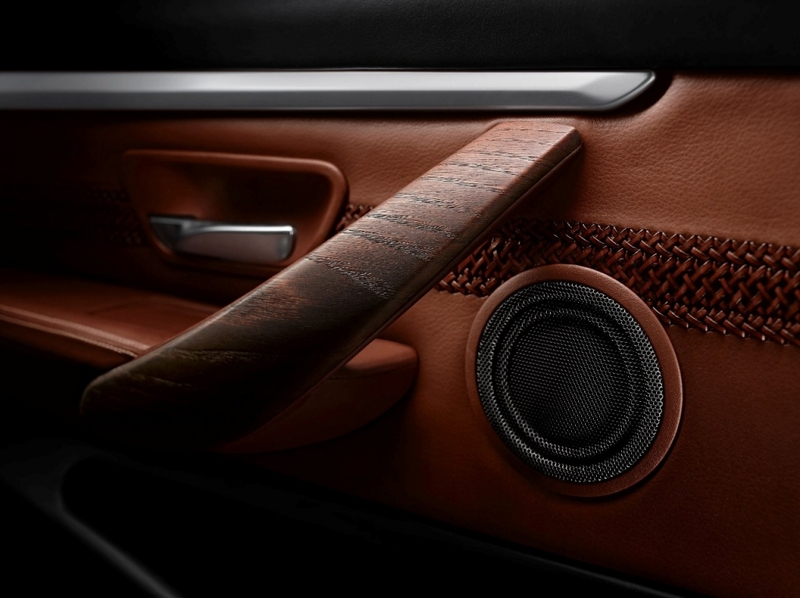 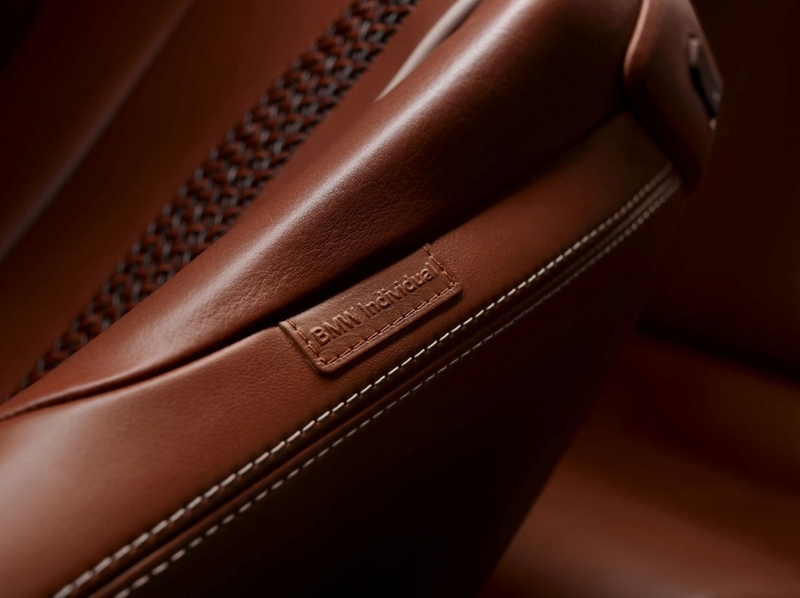 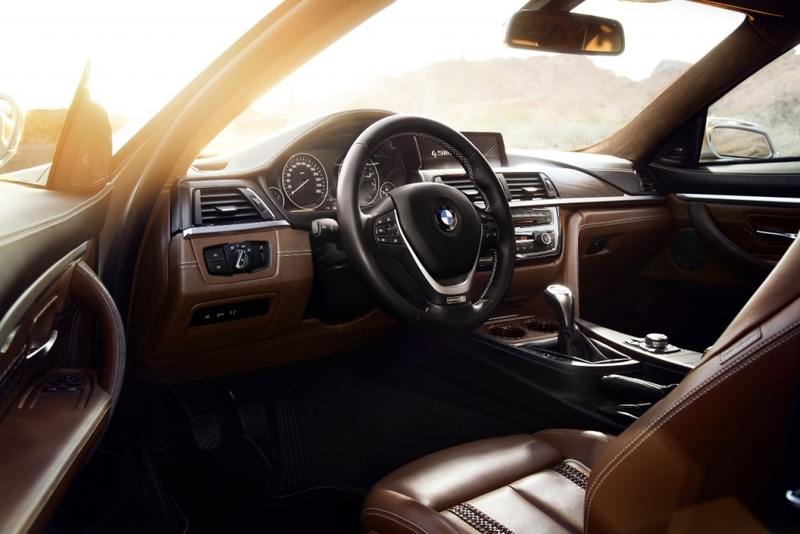 The interior received the expertise of BMW Individual whose skilled craftsmanship and eye for materials helped to create a supposedly superior interior. 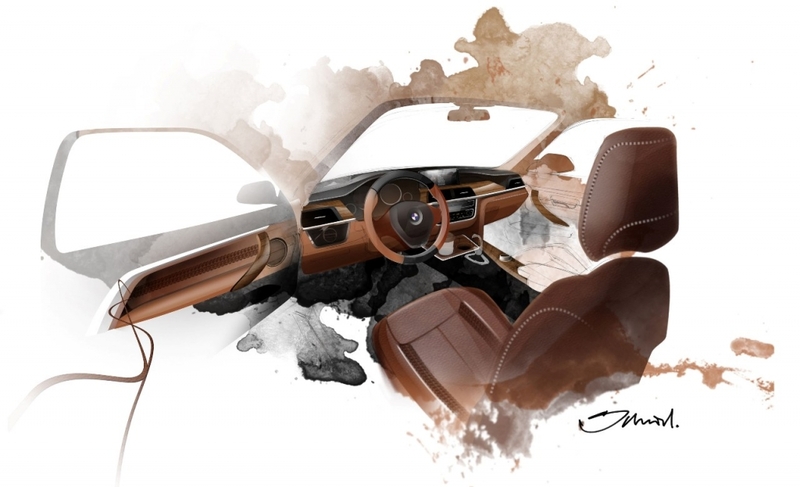 We are not sure of that given the fact that the given car seems to ooze of lots of brown in the interior. 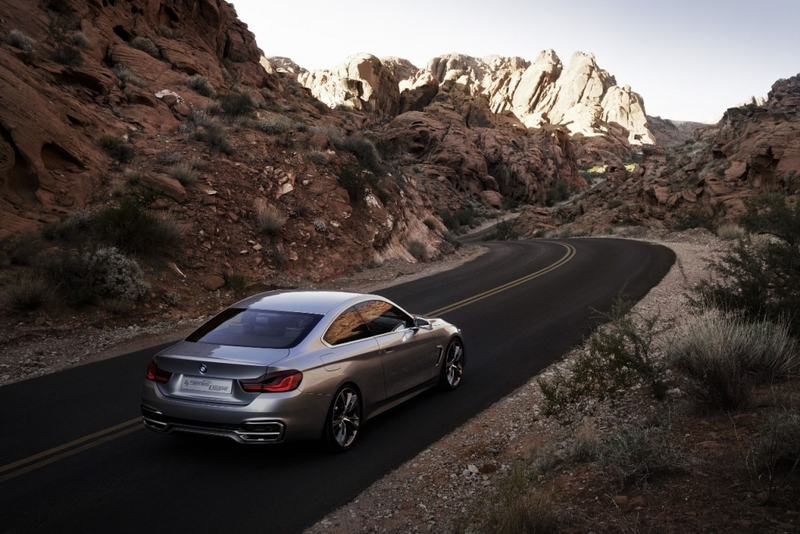 It kind of reminds one of those awful moments when one unsuccessfully regurgitates their food (yes, we mean throw up). 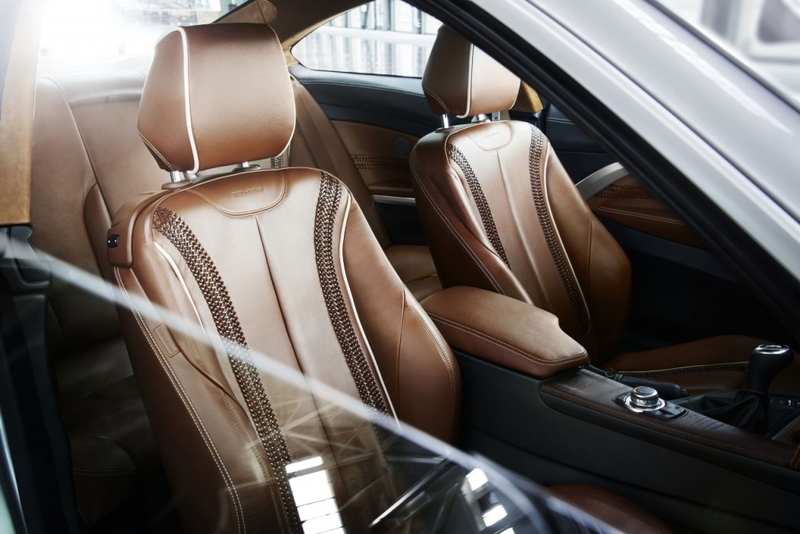 But then again perhaps we should be focussing more on the quality of the material used on the interior rather than the look. 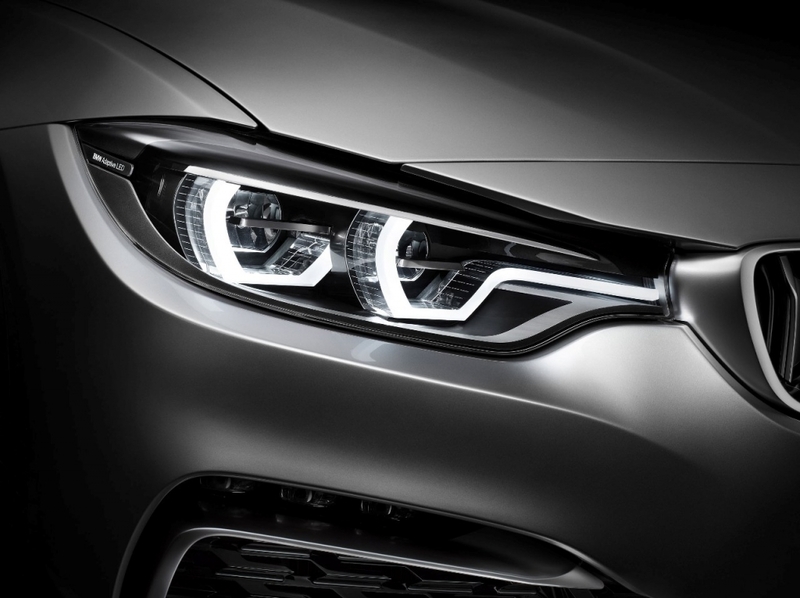 The look we assume is something one can easily remedy. 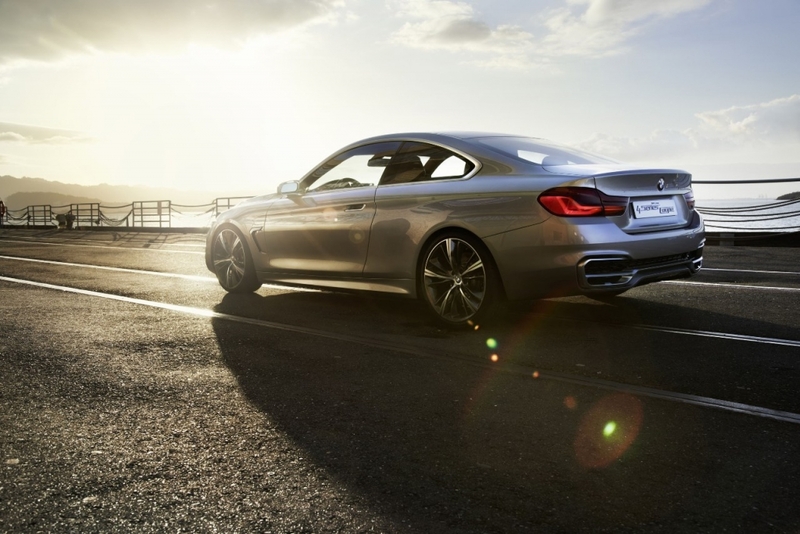 The proportions and silhouette of the BMW Concept 4 Series Coupe give the car an athletic and dynamic presence even whilst standing still. 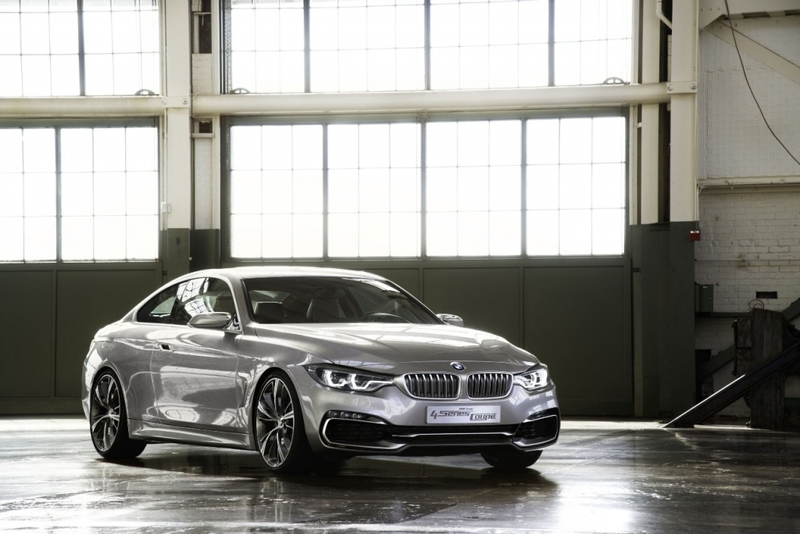 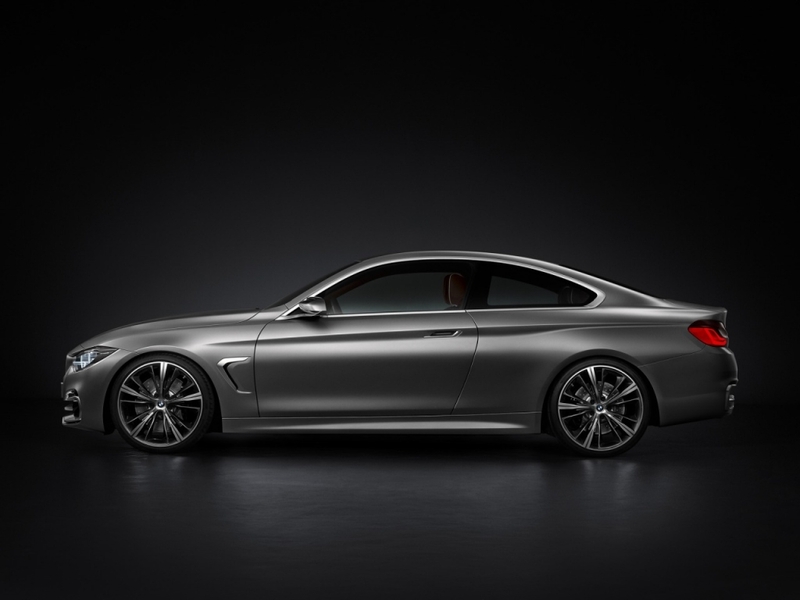 The wheelbase (2810 mm) is 50 millimetres longer than that of the existing 3 Series Coupe, while 45 mm has been added to the front track (1545 mm) and 80 mm to the rear track (1593 mm). 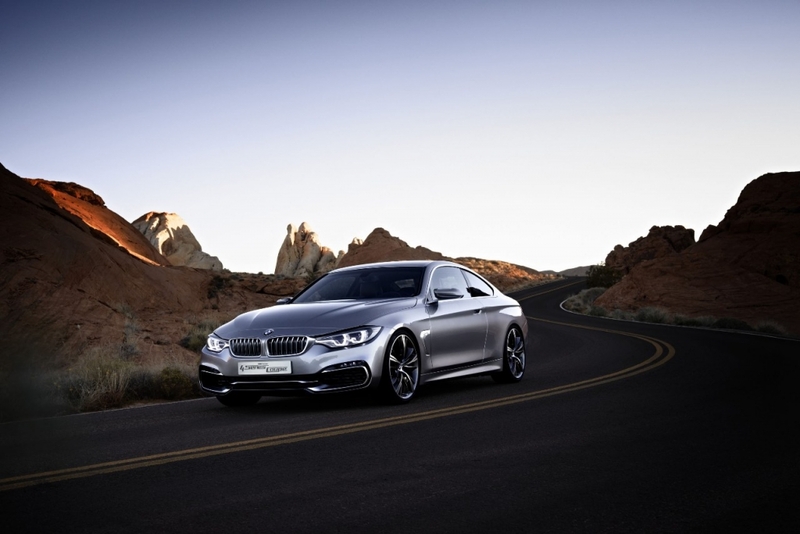 At 1,826 mm wide, the BMW Concept 4 Series Coupe is 44 mm broader than its predecessor, its roof line is 16 mm lower (1362 mm) and it is also longer (4641 mm), all of which makes for exceptionally dynamic proportions. 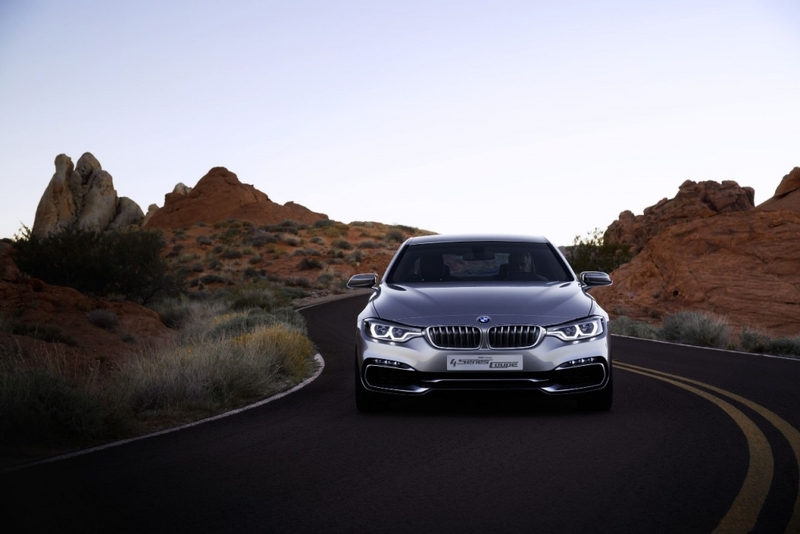 The attention to detail in the BMW Concept 4 series is evident by the detailing of the functional elements such as air intakes and vents, door openers and exterior mirrors which have a classy satin-finish aluminium accents. 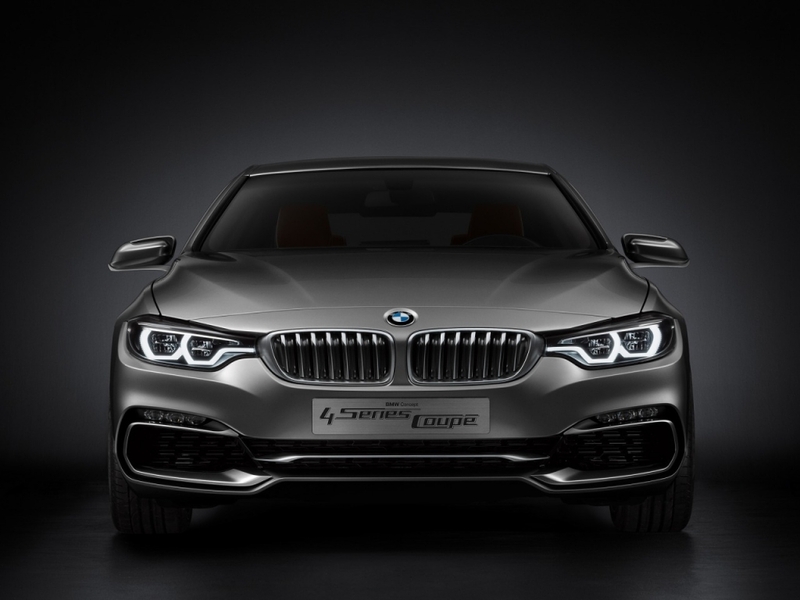 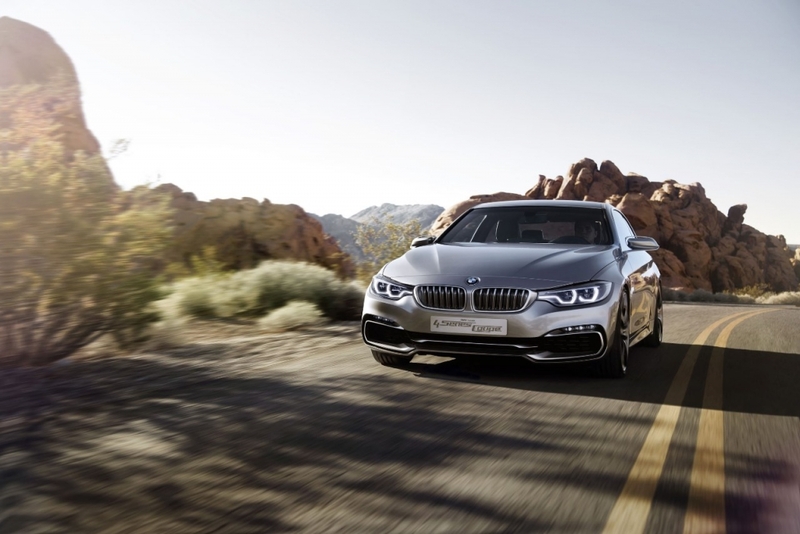 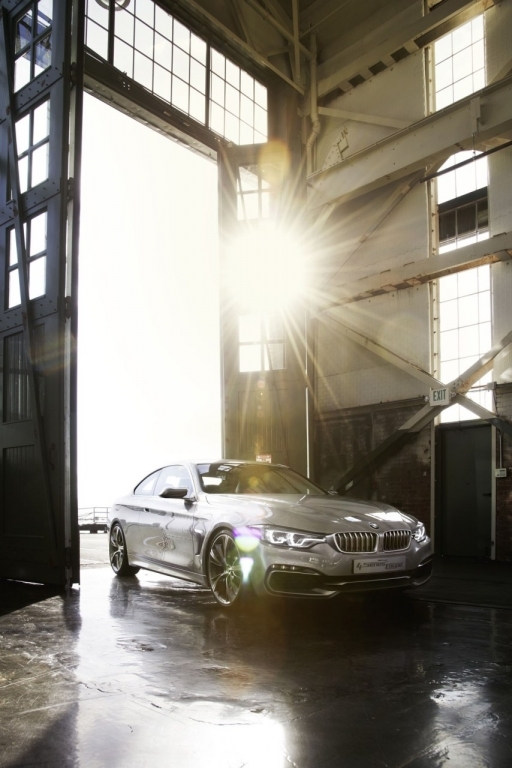 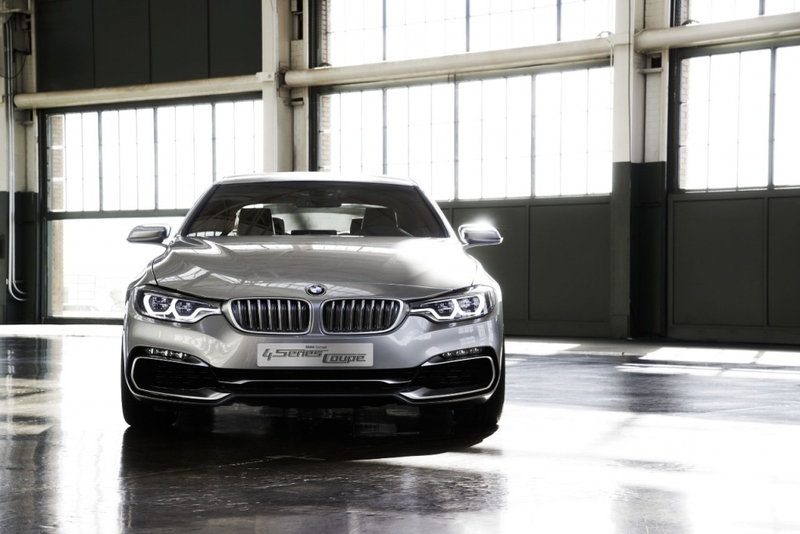 The front of the BMW Concept 4 Series Coupe has the hallmark BMW kidney grille and twin circular full-LED-headlights, albeit having a more slim and sporty design as is already embodied by the current 3 series. 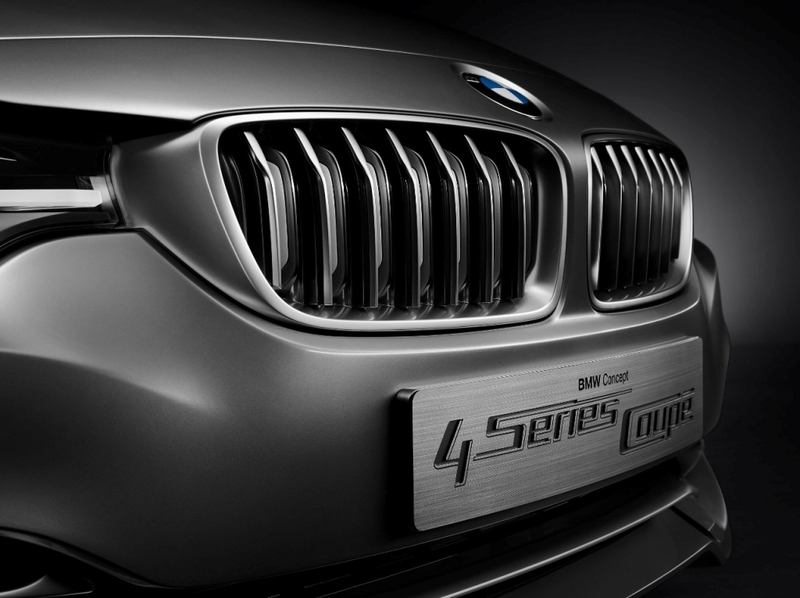 An interesting detail on the grille is the fact that it is closed off. 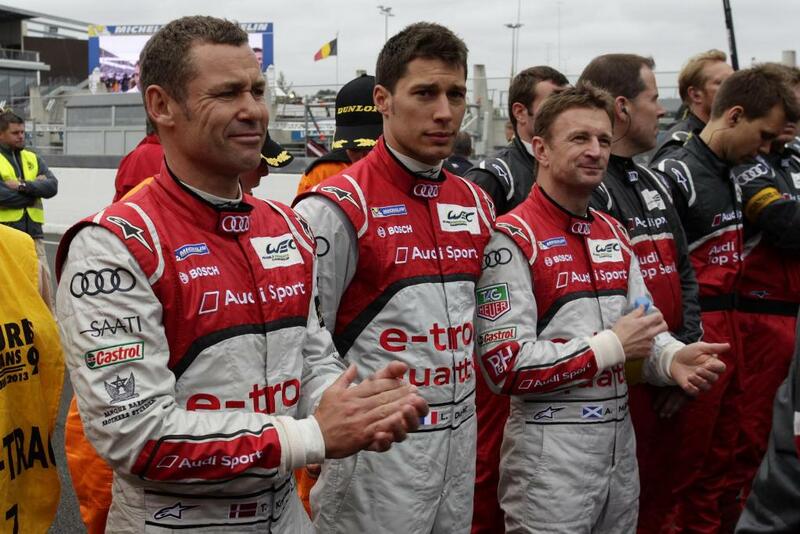 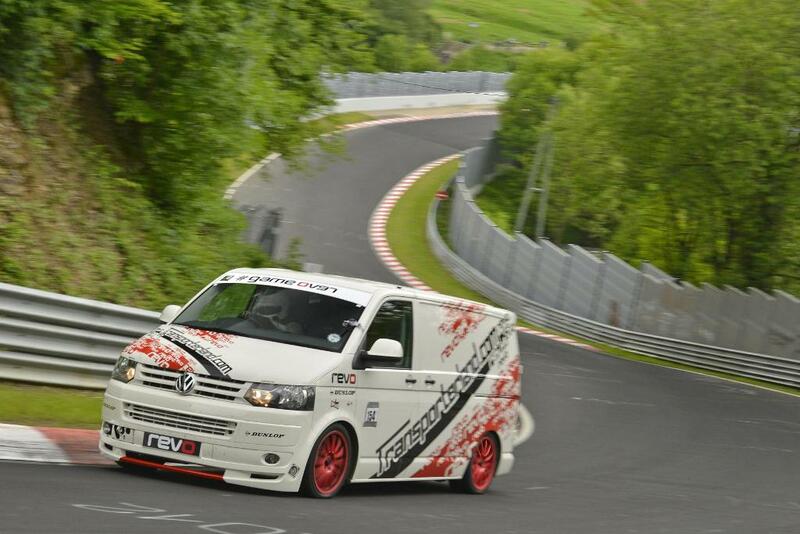 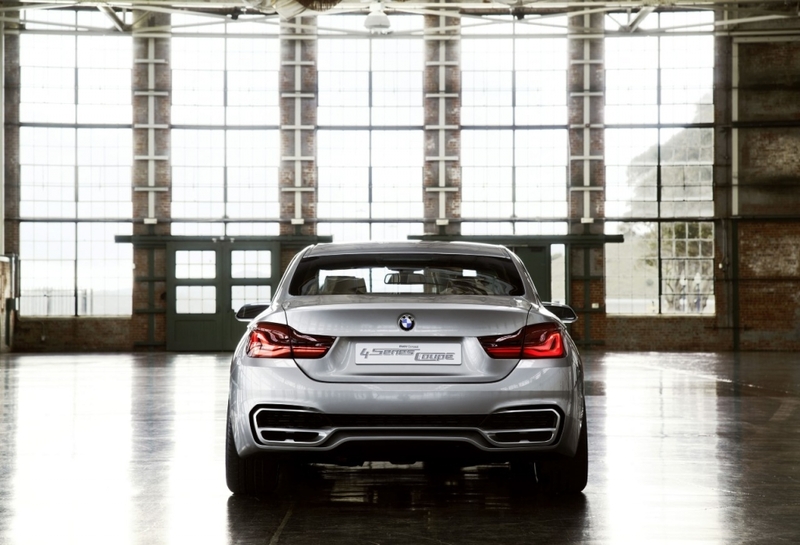 This is done in order to optimise the aerodynamics and to keep the fuel consumption low. 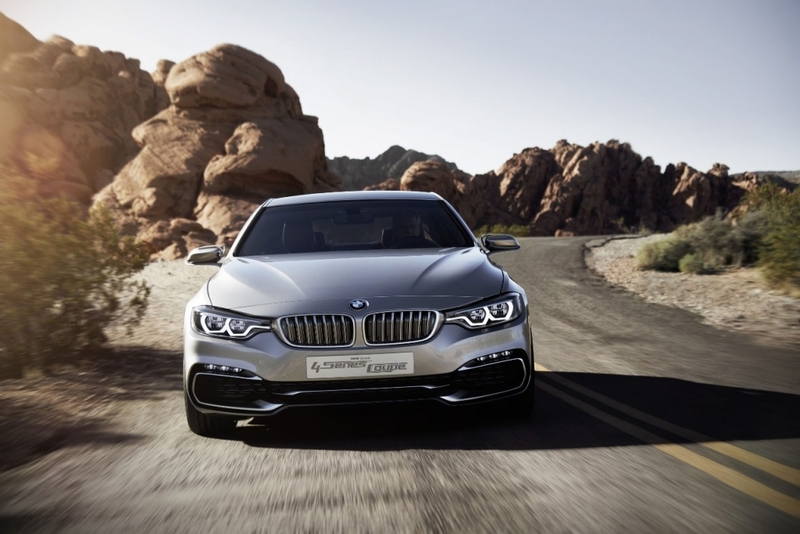 Other than the eye-catching kidney grille and circular headlights at the front, the large air intakes in the front apron also catch your attention. 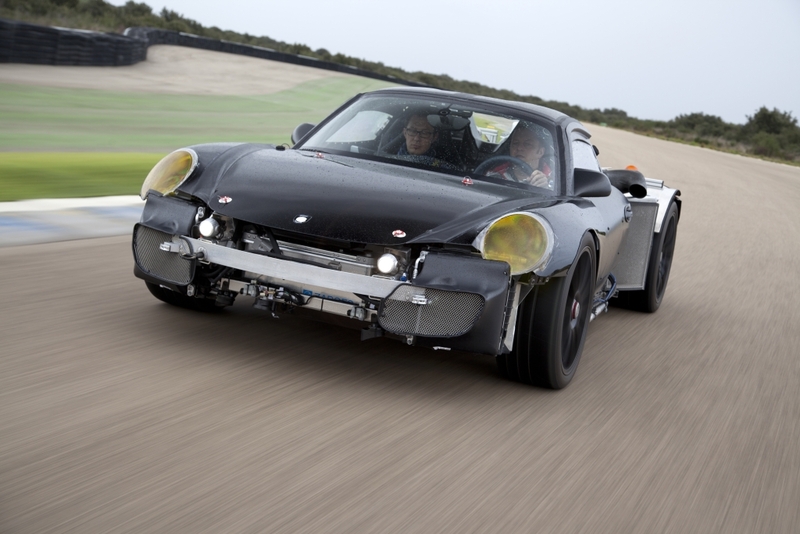 The sheer size of the large air intakes tend too hint at the need for an insane need of air to be channelled to the engine bay to aid with cooling. 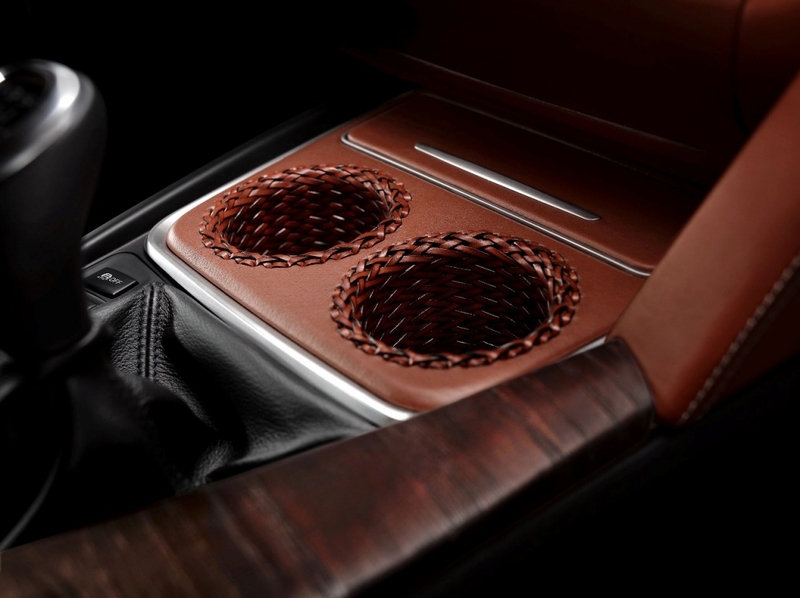 The two vent surrounds on either side of the large intake also channel air for brake, oil cooling and for the Air Curtain. 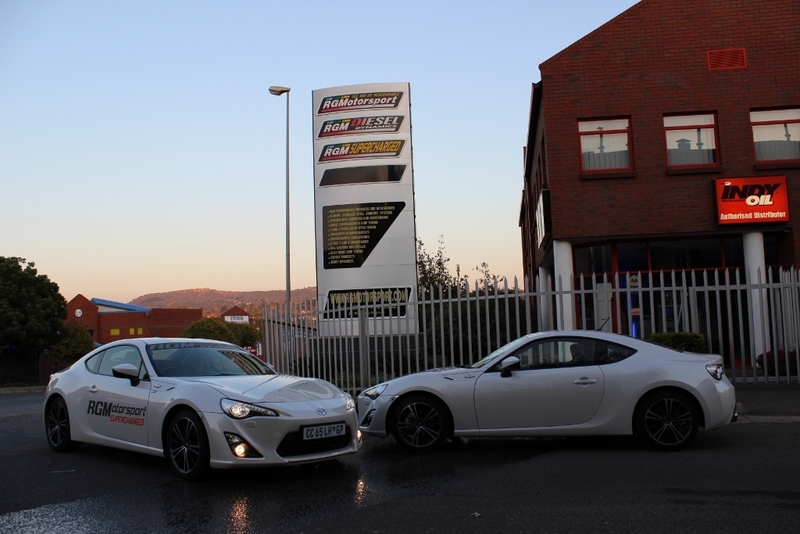 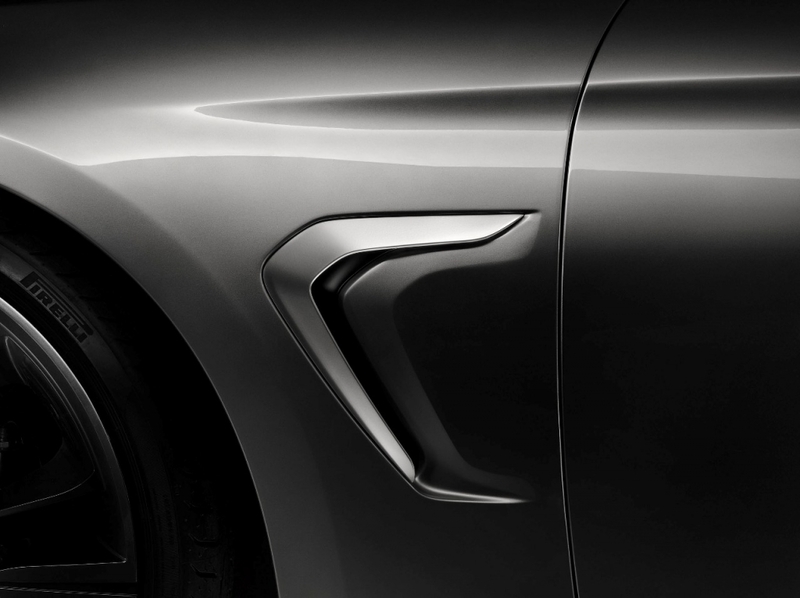 The Air Curtain, an EfficientDynamics feature channels the incoming air around the outside of the wheels, ensuring the airflow “hugs” the wheel arches and fuel consumption is noticeably reduced as a consequence. 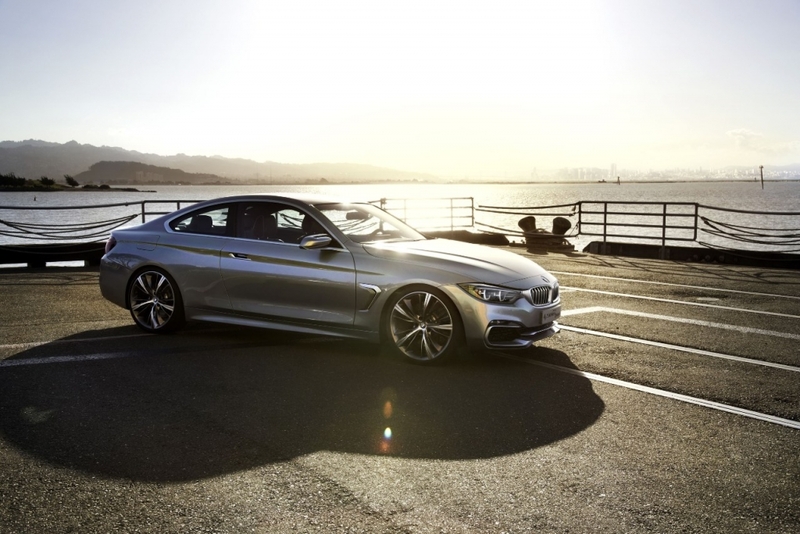 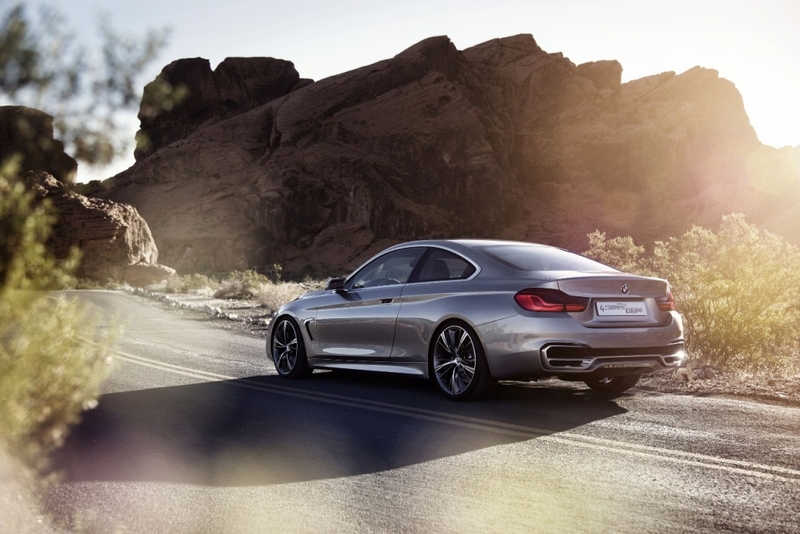 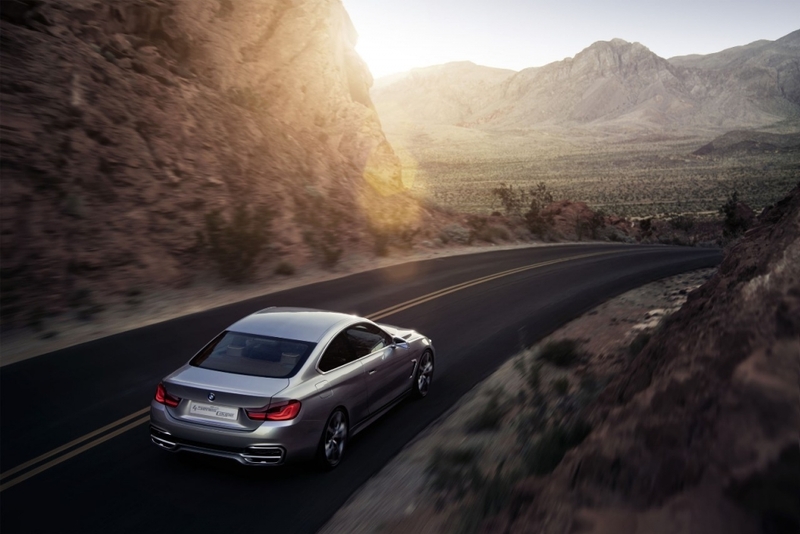 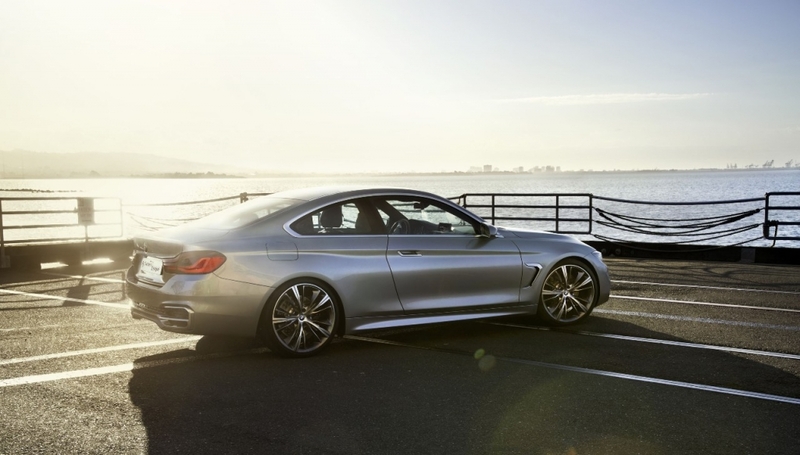 The feature most notable from the side profile of the BMW Concept 4 Series Coupe is the gently downward-sloping roofline which transitions smoothly to the rear of the car, accentuating the sportiness of the car. 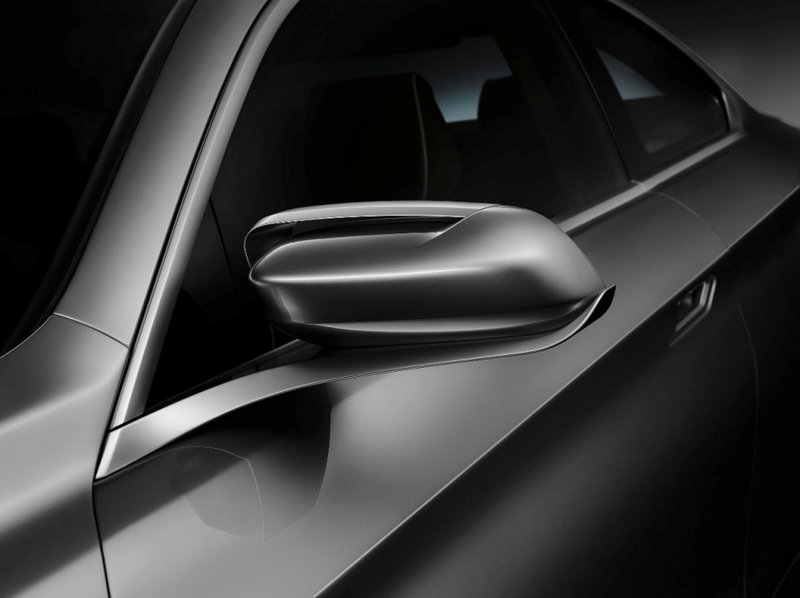 The side windows also adhere to the slim and stretched theme. 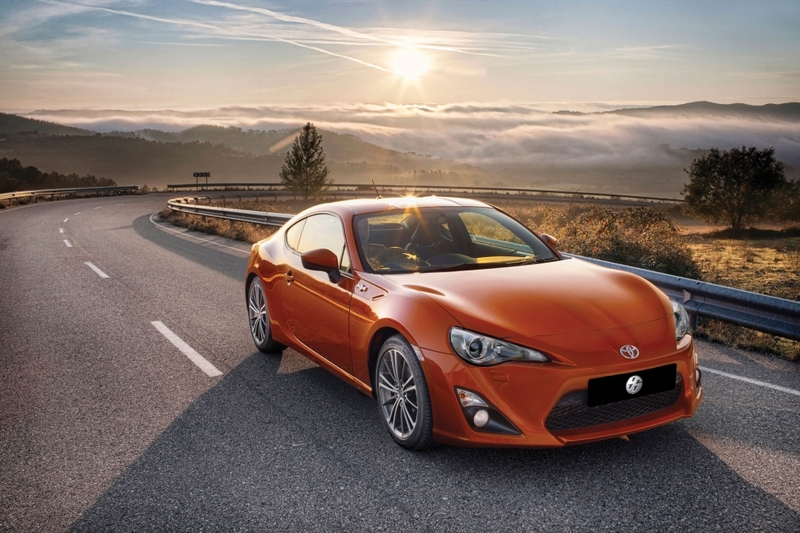 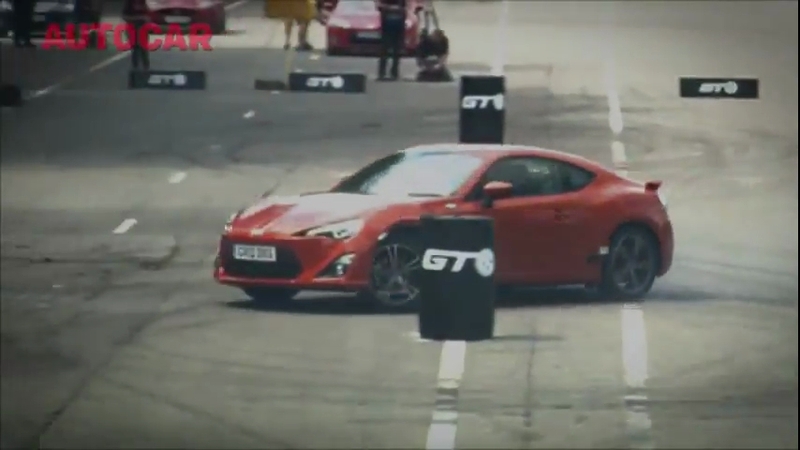 The Air Breather on the side of the car which, an aerodynamically effective aperture behind the front wheel also adds an element of sportiness, and works in tandem with the Air Curtain in the front apron to ensure and effective reduction in drag around the wheels. 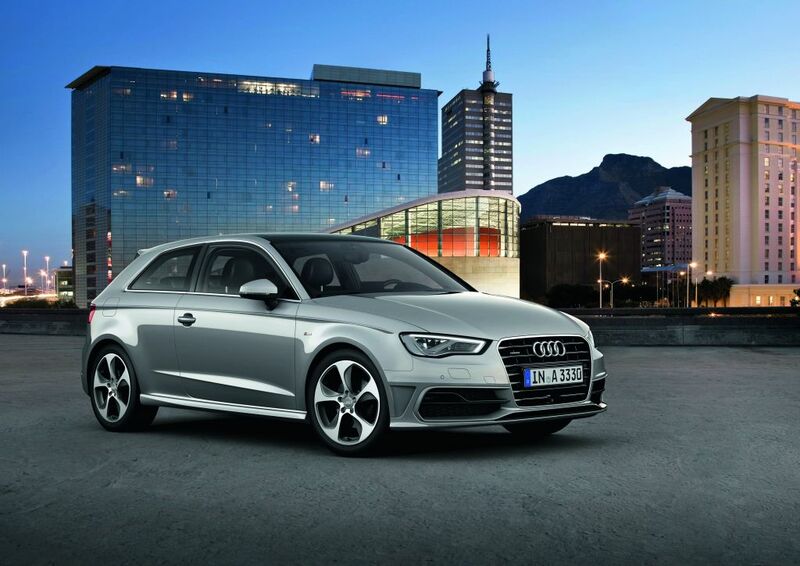 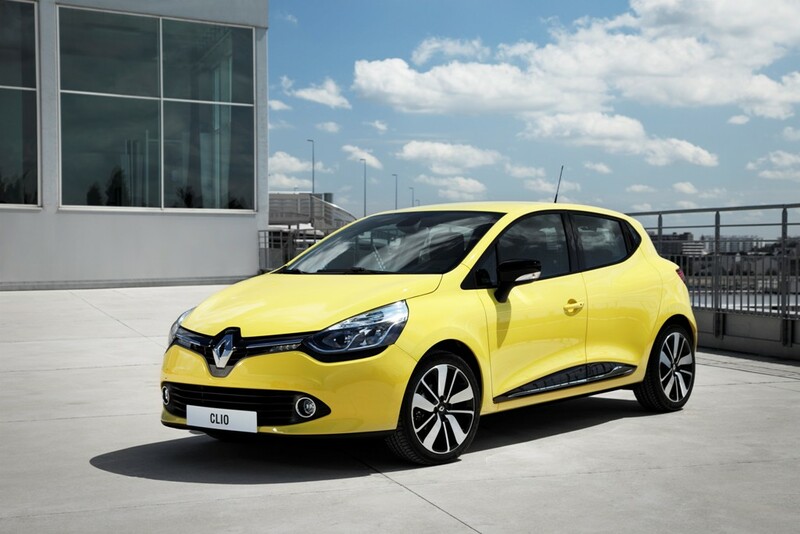 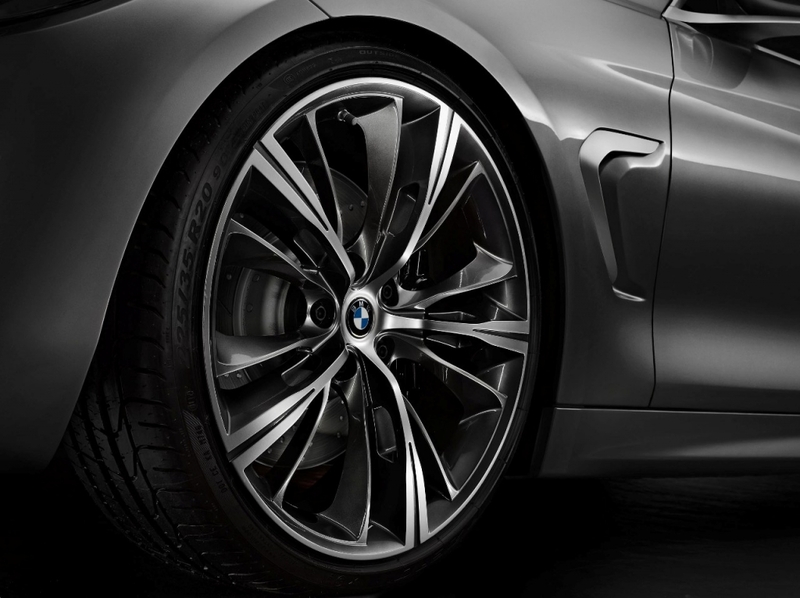 Not to forget are also the 20-inch light-alloy wheels with a prominently three-dimensional multi-spoke design. 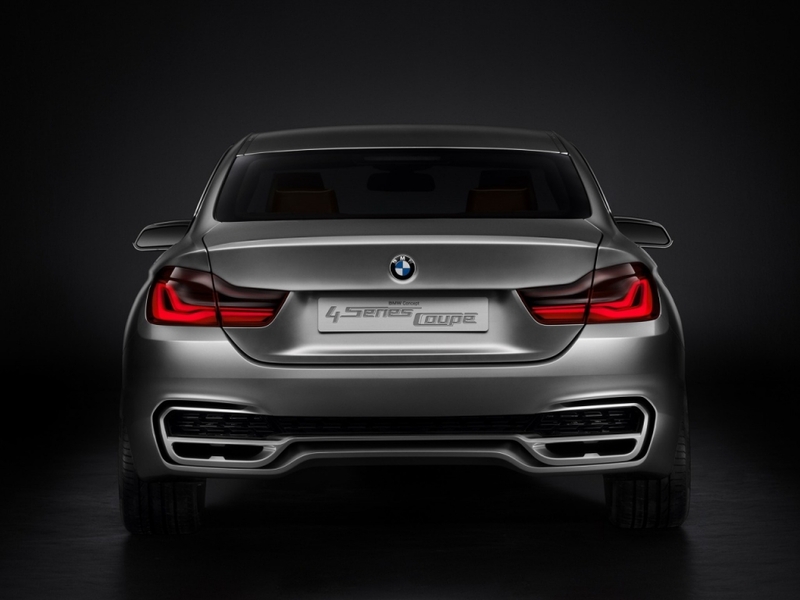 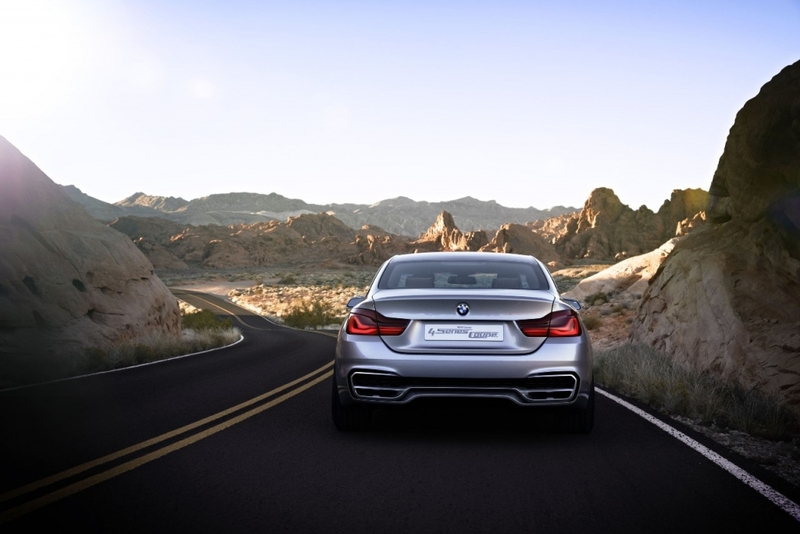 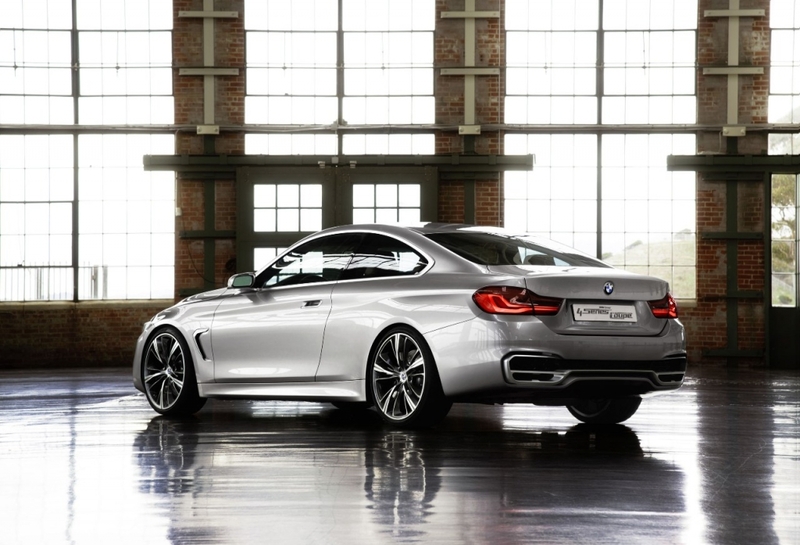 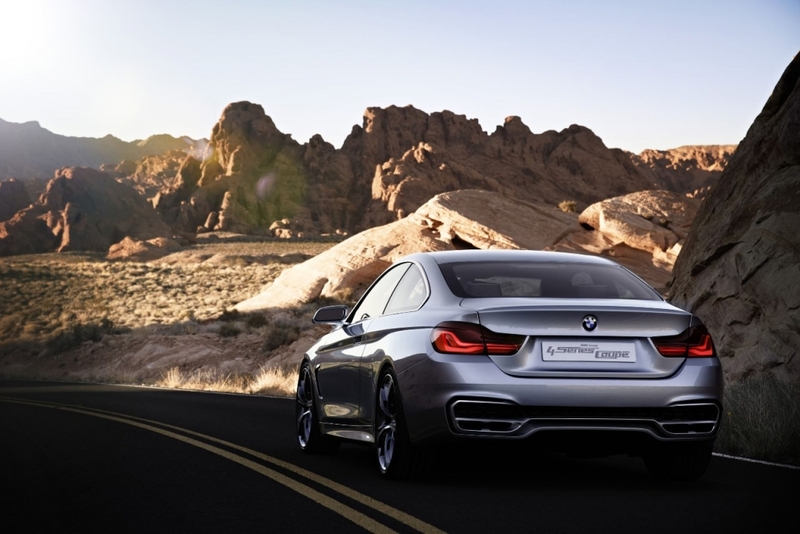 At the rear the L-shaped rear lights of the BMW Concept 4 Series Coupe blend harmoniously into the car’s overall design. 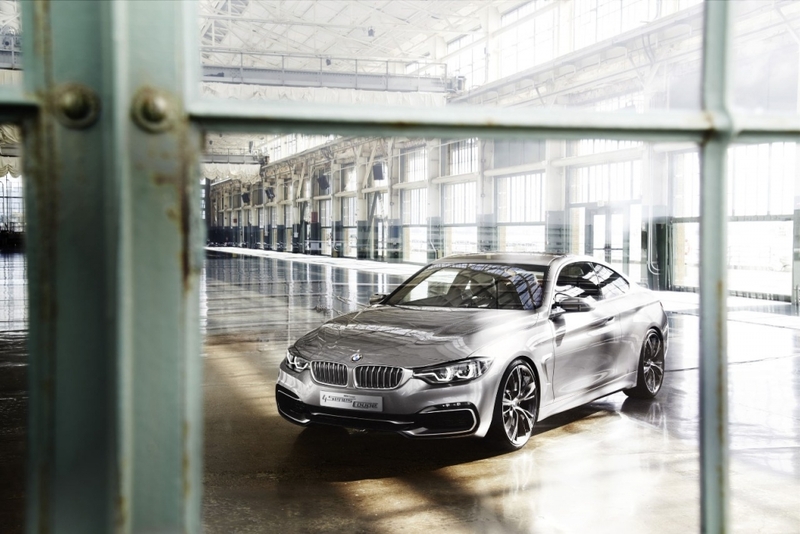 The design of the rear window has a lowering effect on the car’s tail and gives the body as a whole an even more powerful look. 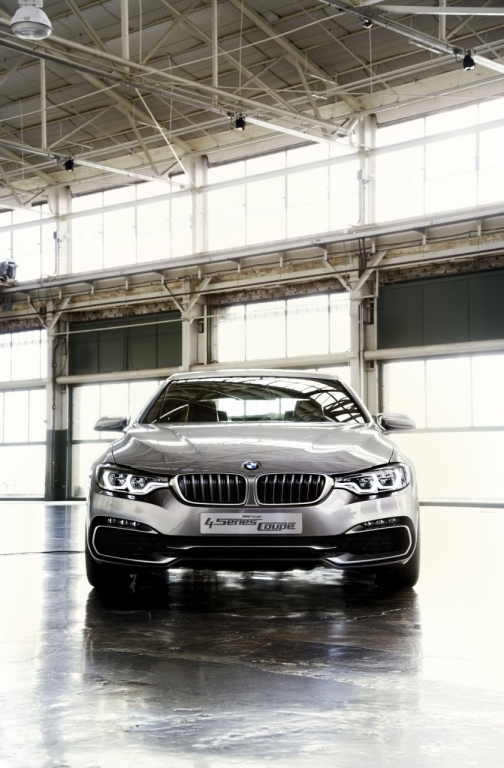 However the most striking element at the rear of the BMW Concept 4 Series Coupe is the bumper which has a clearly defined trim element in satin-finish aluminium. 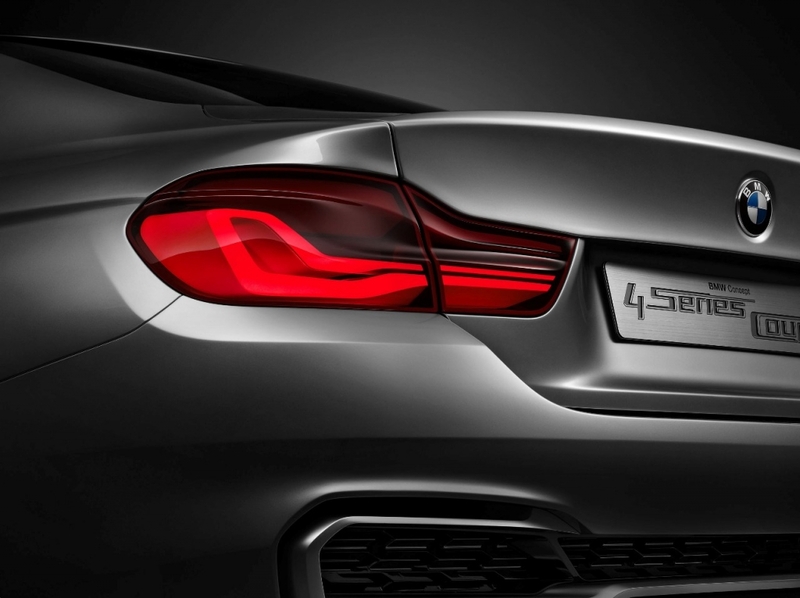 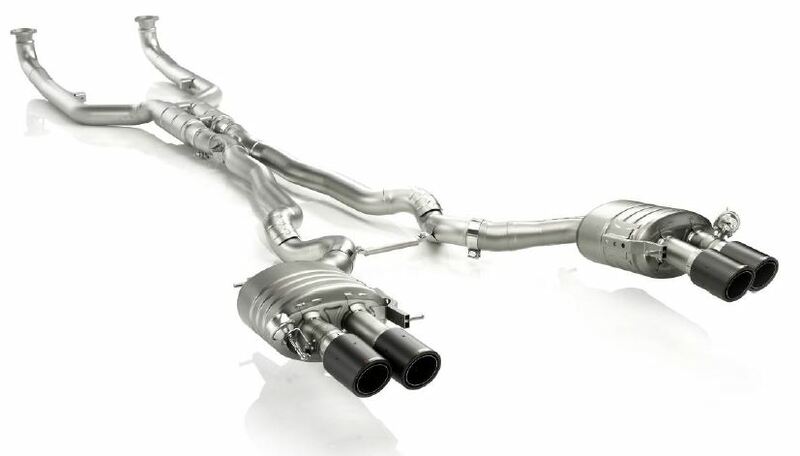 This trim element adopts a similar three-way split to the front air intake, but in a width-emphasising form and engulfs the two exhaust tailpipes. 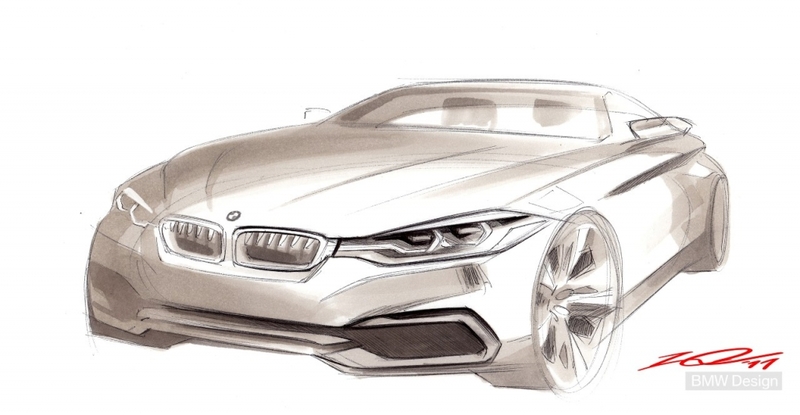 To be honest we are not sure if this really looks great. 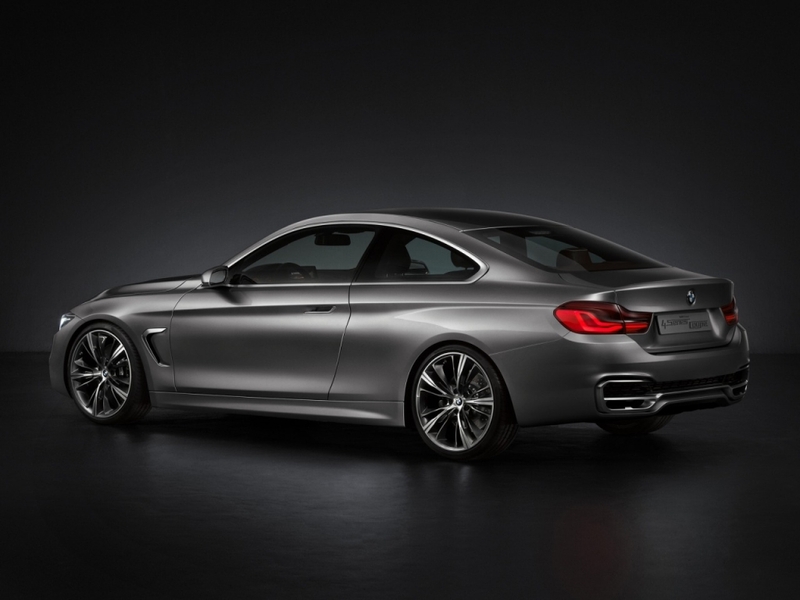 To some extent it almost feels a bit odd on the BMW Concept 4 Series Coupe, it kind of conjures and image that the designers decided to look at the rear detailing of the McLaren MP4-12C or the Audi R8 for their inspiration on the rear of the car. 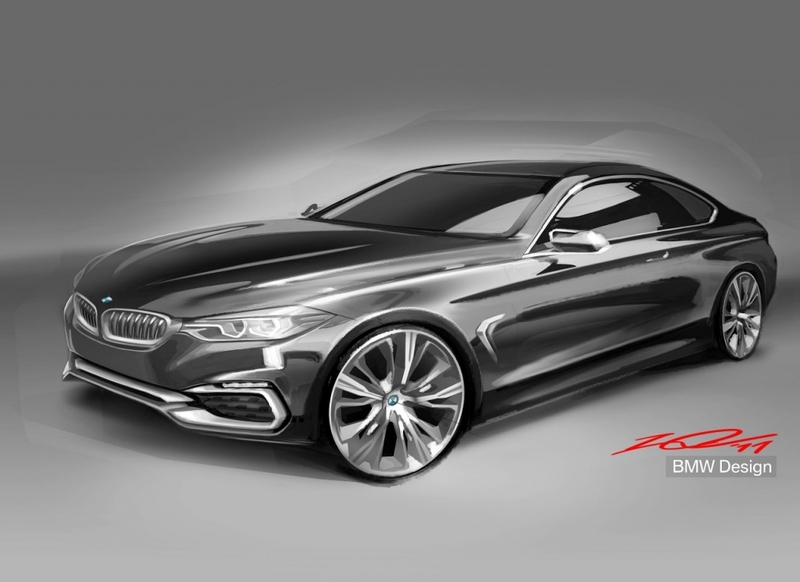 But overall we are really pleased with the look of the BMW Concept 4 Series Coupe, it is certainly a huge departure from what we have come to know on the BMW 3 Series coupe’s in the past.